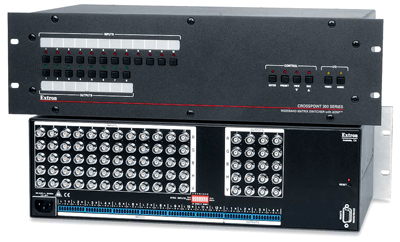 The Extron CrossPoint 300 124 Switcher is designed to route wideband RGBHV and stereo audio signals. 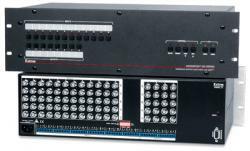 This 12x4 matrix switcher features 300 MHz (-3 dB) bandwidth, fully loaded, and are also fully compatible with RGBS, RGsB, HDTV, component video, S-video, and composite video signals. Outputs: Video on female BNC connectors; audio on captive screw connectors. Extremely flat response - Switcher performance is further enhanced by the extremely flat response in the critical portion of the bandwidth curve, between 0 and 130 MHz.